I signed a contract with Shen's Books! It's going to be a very busy end of the year for me! But that is a great feeling...because I just signed my SECOND book illustration contract today!!! WOOHOO!!!! I won't go into too many details just yet, but I can say that this book will creatively introduce children to music and Chinese musical instruments. I am super excited because music has always played an important role in my life. 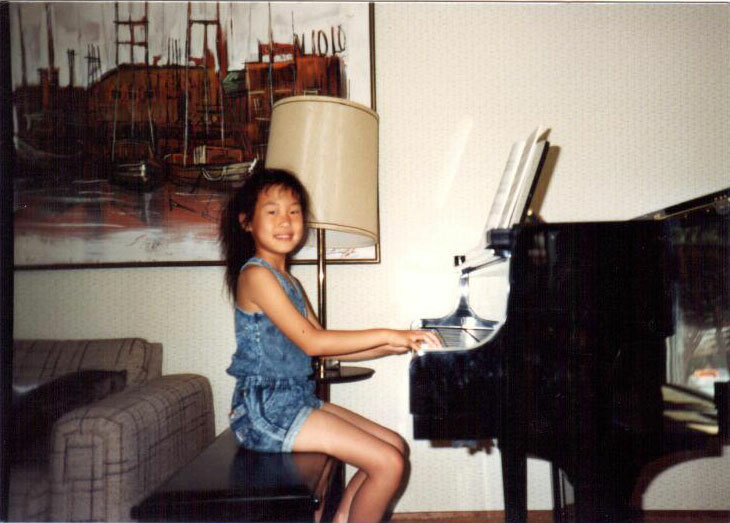 Me playing the piano and wearing all denim. It was definitely the 80s. Me with a tamborine, Ryan B, Ryan P, Dave, and Matt in a cover band. Anyone request some Pat Benatar? Gotta love 80s music! The book will be published by Shen's Books and will be released early next year. To find out more about Chinese musical instruments, check out these two youth orchestras in the Bay Area: Firebird Youth Chinese Orchestra and California Youth Chinese Symphony.